Exclusive SnoreRx Promo Code: 10% OFF Coupon! Buy your SnoreRX for snoring now using our exclusive coupon code below and SAVE 10% on Your Order! Click Here to Get The Offer! Click the link above and use the coupon code SNORENATION for our exculsive SnoreRx discount. What is the SnoreRx Mouthpiece and how does it stop snoring? The SnoreRX mouthpiece is a Mandibular Advancement Device (MAD) that holds your lower jaw in a forward position and keeps the airway in the back of your throat open, thereby significantly reducing snoring. This is the same concept as the ZQuiet and Zyppah but the SnoreRx is adjustable. When the airway in the back of your throat is closed, breathing is more likely to make tissues vibrate, causing the snoring sound. The SnoreRX is an Adjustable MAD made of a BPA and latex-free copolymer. The material allows for a boil-and-bite fitting so the SnoreRx can take the shape of your jaw while giving you an extra degree of comfort because of the soft plastic that comes into contact with your gums. My review for the SnoreRx is “best-in-class” because it is adjustable, meaning that after the boil-and-bite process, the lower tray can be shifted forward by small 1 mm increments to give you the most comfortable fit possible (up to 6mm forward). The device has a hole at the front, allowing you to breathe through your mouth, which is useful when you can’t breathe through your nose during flu or allergy season. The SnoreRx reduces teeth grinding since it holds your jaw in place. The SnoreRX is FDA approved, meaning it was completely analyzed by the FDA, and the company behind the product has been selling this product since 2009. The entire product is manufactured in the USA. For snoring, you cannot find a better product then the SnoreRx. Customer reviews all over the internet of the product are consistently 4 and 5 stars. Read the rest of my review to understand why you should purchase this anti-snoring product. I’ve used the SnoreRx for years. Every eight to ten months I buy a new one. If I forget to wear it at night I hear about it, believe me! The SnoreRx is and has been a part of my nightly sleep routine for a long time. I cannot recommend the product enough. Read on in my review to learn more about the SnoreRx. The SnoreRX is made of a BPA and latex-free copolymer. This is preferred for products that come into contact with food or that you put in your mouth. This is because BPA is a chemical that has been related to negative effects on the brain and heart and even cancers. Many people are allergic to latex or sensitive to it in some way, so it ideal to have a latex-free product in the case of a mouthpiece. The SnoreRX is an Adjustable Mandibular Advancement Guard. It is molded through a boil-and-bite process to take the shape of your jaw and in order to push the jaw forward the lower tray can be moved forward 1mm at a time, up to a total of 6mm. With the SnoreRx you control how far out you want your lower jaw to be, which gives you a better overall fit. When I review products, fit is the most important factor. The SnoreRx is my top-rated review since it has calibration. Buy SnoreRx from the manufacturer. The SnoreRx has a hole at the front to allow the user to breathe through their mouth. If a MAD doesn’t have a hole in it, it is very hard to breathe with the mouth closed during sleep. SnoreRx competitors fall short on comfort. The SnoreRX can be worn if you prefer to sleep with your mouth open or closed. When I review anti-snoring products, comfort is my most important priority. 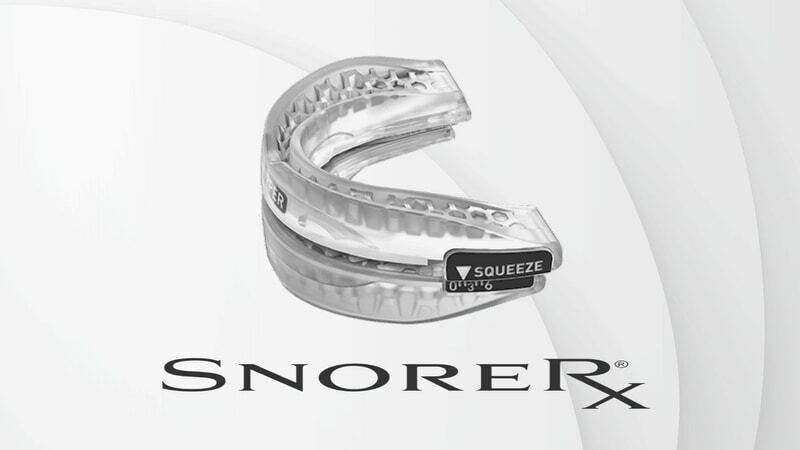 The SnoreRX is an Adjustable MAD that stops you from snoring by keeping your lower jaw in a forward position. The reason this works is because of the main cause of snoring: the vibration of tissues in the back of your throat due to the relaxation of your muscles while asleep, and a partial blockage of the airway in the throat. While asleep, your muscles relax, making the tissues in your throat more likely to vibrate. This is the main cause of snoring – relaxed throat muscles. So when you breathe, air has a harder time passing through that narrowed region, making the tissues there vibrate. To stop snoring, simply open the airway wider, or keep the muscles there from relaxing. Holding your lower jaw pushed forward opens the airway wider. Clinical studies have proven this works to eliminate snoring. Although reviews are positive on the SnoreRx, clinical studies also support usage to stop snoring. Before using the SnoreRX, just like with any mouthpiece, brush your teeth and make sure your mouth is clean. You mold the trays yourself at home through a simple boil-and-bite process and then adjust it forward a millimeter at a time to hold your lower jaw in a forward position like explained in the video below. The manufacturer says you can remold the trays three times before it starts losing its shape and becoming unusable. The SnoreRX lasts between 10 and 15 months depending on the user and on whether it is properly cared for. For instance, if you usually grind your teeth during sleep, the SnoreRx may last closer to the 10 months since it will constantly be abrased by your teeth grinding. Buy SnoreRx from the manufacturer. As for cleaning, the manufacturer says you can clean it with warm water after each use, though all other mouthpieces on the market are recommended to be cleaned more thoroughly using a toothbrush, toothpaste, and cool water after each use, and to also use a denture cleaner about once a week. The reason for this is the device will accumulate a certain amount of bacteria if you only rinse it in warm water, especially because of the adjustability feature, which uses six small crevices to allow you to slowly push the lower jaw forward. To clean it thoroughly, you can separate the two trays by pushing the lower tray forward beyond the 6mm it allows for, in order to unlock the two pieces. An important point about cleaning: you must let it air dry. After having let it air dry, store it in a dry place, away from the reach of your dog. There are a few side effects that you will experience the first few days wearing the SnoreRx, but all of them will be significantly reduced by the end of the first week. These side effects are not specific to the SnoreRX but apply to all MADs. Online reviews and my personal review have proven that the SnoreRx is still the most comfortable anti-snoring MAD. Sleep will not come easily the first few minutes while wearing the SnoreRx. If you find your jaw to be excessively sore when you wake up, you may want to re-adjust the lower tray of your mouthpiece backwards by a few millimeters. You should never feel an intense, acute pain in your jaw. Only soreness. There have not been any clinical trials run on the SnoreRX specifically, though Mandibular Advancement Devices, in general, are a proven solution to stop snoring. Many MADs have gone through clinical trials. Also, the Food and Drug Administration has approved the SnoreRX. No other anti-snoring product that I know of has FDA Approval. For my review, I consider this to be a critical factor, as buyers can trust the safetly and reliability of the product. Will The SnoreRX Mouthpiece Work For You? The SnoreRX has moderately good reviews online, the main reason for this seems to be because many users have found it effective, but somewhat uncomfortable. However, this is because it takes a few nights to adjust to. After a week or so of use, I didn’t even think about having it in during sleep. The majority of users agree that the device does significantly reduce, or eliminate snoring. The side effects will fade away after a few days, as previously mentioned. Adapting to wearing a MAD during sleep takes practice. Online reviews have complaints about users not able to sleep with it – however, this is simply due to not giving the SnoreRx enough time. Over a few days, your body adjusts to using it and sleep is no problem. The hole at the front of the mouthpiece will allow the user to sleep even when he/she has a stuffy nose, which is a convenient feature at times. The appliance will only stop you from snoring if you snore because of vibrating tissues in the back of your throat, which is the most common cause of snoring. This will often be the case in overweight, or slightly overweight individuals because of the fat around the throat narrowing the airway. However, it can obviously happen to anyone. 3rd party reviews show that both women and men and the young and old, all wear the SnoreRx and have success with it during sleep. The SnoreRX cannot be worn by people with dentures or loose teeth. The 30-day money back guarantee makes trying this device relatively cheap, though the company will not reimburse you for shipping costs if you return. I welcome your feedback and review – feel free to contact me by email or contribute to the comments below. It costs $129 for one piece or $154 for 2 (that’s $77 each). At the moment ON SALE for $99 for one mouthpiece. Shipping costs in the US are of $6.95 USD. As of August 1, 2017, SnoreRx has introduced international shipping for their product. This is a great benefit. To see a list of countries view SnoreRx shipping. The company that manufactures the SnoreRX also manufactures a similar device made exclusively for treating sleep apnea. The company is called Apnea Sciences Corporation, was founded in 2009 and is based in Laguna Niguel, California. The SnoreRX has been approved by the FDA and has excellent reviews and customer feedback. Customer service has been superb the few times I’ve emailed Apnea Sciences. They responded quickly, helped me with the device setup and always have fast shipping when I order new ones. My review of customer service is A+. The Device will last between 8 and 15 months, depending on the user. It should probably be cleaned after each use using a toothbrush, toothpaste, and cool water, even if the manufacturer only says you need to rinse it in warm water. There have been no issues with quality. Over 800 customers have submitted a review with an average rating of 4.6 out of 5. Any negative reviews are due to customers not adapting well to using the SnoreRx. To read more reviews of the product visit the official SnoreRx site. The SnoreRX mouthpiece is an Adjustable MAD. It keeps your lower jaw pushed forward in order to clear the back of your throat, allowing air to freely pass through. It is both BPA and latex free and is made of copolymer, making the plastic around your teeth softer. Because it is adjustable, not only will it take the shape of your jaw through a boil-and-bite process, but you will also be able to push the lower tray, the one holding your lower jaw, forward by 1 mm increments, allowing for a very precise fit. The most common side effects are excessive drooling and a sore jaw. There is a 30-day guarantee, though you will not be paid back the shipping fees. It costs $99 USD for one or 154$ for two. Finally, the product has received excellent reviews, and it has been approved by the FDA. Excellent customer service reviews, user reviews, and my positive experience make SnoreRx my favorite product review. Summary: Excellent reviews online and will allow for a good fit. The 30-day money back guarantee makes this a great product to try.